Robert Griffin III's comments immediately following the Redskins' 27-7 loss to the Buccaneers last weekend fed headline makers for days, so his first press conference since Sunday was understandably met with some sort of twisted anticipation. What we got was a robotic performance, as RGIII made sure to let everyone in attendance know that he is focused on San Francisco. Like, a lot. You sort of expected this kind of deflection after the controversy that developed a few days ago, but the reactions, which you can peruse below, were quite entertaining. Griffin answering every question the same. "I'm just focused on San Francisco. Perfecting my craft. That's all we can do." Over 7:30, Griffin said "focused on San Francisco" nine times in 24 questions. Only one question was about San Francisco. Four other questions referenced "preparing for San Francisco" or "beating San Francisco." Four responses lasted fewer than four words. 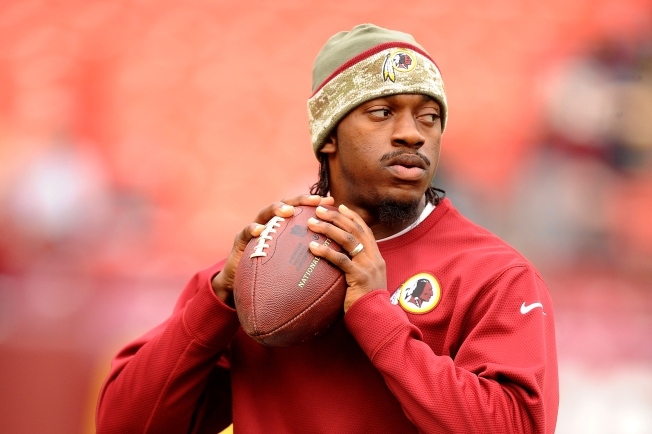 This is quite the Belichickian performance from Robert Griffin III. That Griffin presser was as painful as any I've attended here since The Final Days of Zorn. Robert is being handled like a puppet on and off the field. They don't trust him in the huddle or at the lectern. This is over. Has adidas rolled out “Focused on San Francisco” socks yet?